This exists? Yes. It does. But will we ever get this at the LCBO? SIGH. Probably not, as what we can buy here is decided by a committee I imagine consists of your mom, some lady who got kicked off the censorship board and ten other random jurors. I’m always being told that the LCBO has the biggest selection anywhere – but that doesn’t matter when half of it’s crap. There are WORLDS of Armagnacs, whiskeys and Sojus we can’t get here, not to mention liqueurs with flavours like lavender and violet that I’m always reading about in American magazines. And selection is meaningless on a PROVINCEWIDE basis. You might not be able to buy all the things you can get at the LCBO in one New York store. But you can get it all and more in the city. Also, I once tried to ship some wine into Canada, because Whitesnake has a wine and you gotta have that, right? And the LCBO tried to charge me over 100 percent of the price, on top of the price just to get it into the country, so I had to send it back. I HATE the farkin’ LCBO. 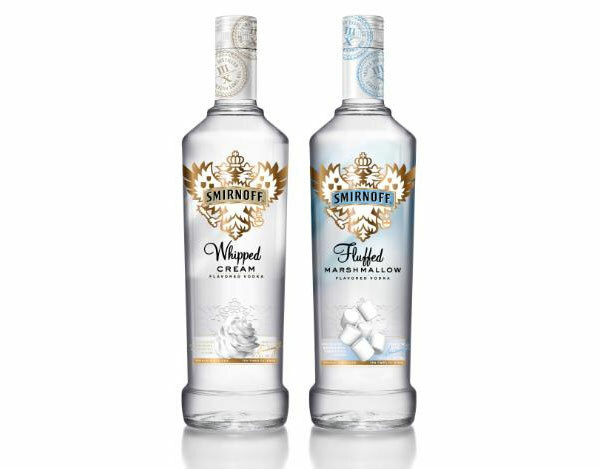 ANYWAY, fluffed marshmallow and whipped cream flavoured vodkas. Just knowing these are out there makes me happy. And a little bit sad. The marshmallow vodka is delish let me tell you. On a recent trip (over 48 hrs, hello duty free allowance) to Seattle we saw this advertised on the side of a taxi. Thinking of other vodka-based drinks that we liked, we mixed it with kahlua (Black Russian). Low and behold the “Russian Snowman” was born.